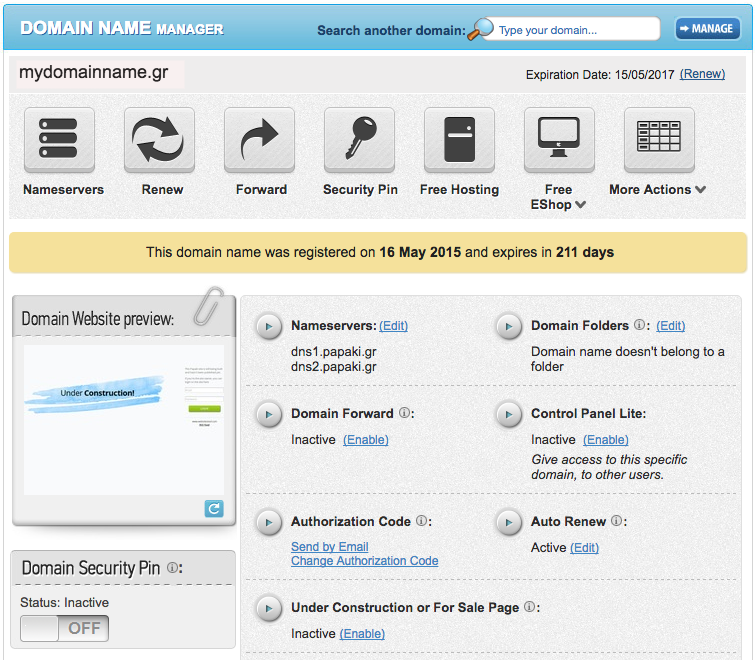 Security Pin is a new safety level, added to Papaki's Control Panel in order to better protect your domain names. By activating the Security Pin for a domain of yours before changing Nameservers, Contacts and Authorization Code, you need to receive a pin via SMS at your cell phone, and insert it to a field inside the Control Panel. In this way, you can be sure that no one will be able to take control of your domains or account, even if someone illegally tries to access your account. 1. Add it to your card when registering a domain. 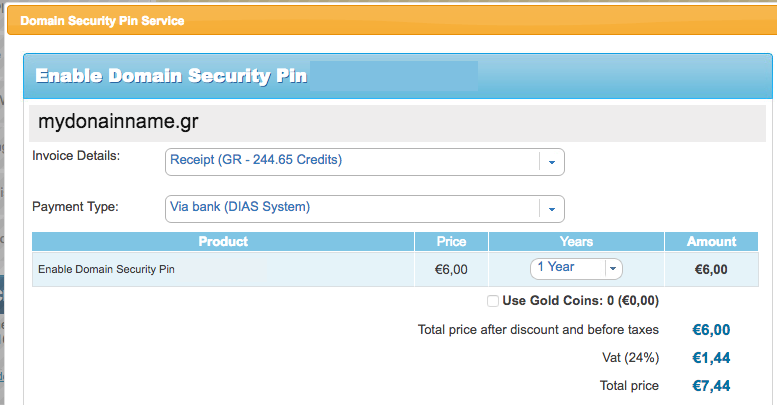 When you register a new domain name, add Security Pin in your cart, in the same order, as shown below. 2.Activate it through your Control Panel for existing domains. a. Log In to your Control Panel and go to your domain management page. b. Click on "Domain Security Pin" at the right bottom of the page, as shown below. c. Select your payment method and complete the procedure. Each time you enter a Security Pin, you gain access to all of your protected domain names, until you log out of your account. To activate the Security Pin service, you need to have a cellphone number saved in your account. In case there is no cellphone number saved yet, you will be redirected to "Profile Manager", and the tab "Email/SMS Notifications". There, you will need to add and confirm your cellphone number via SMS, and afterwards indicate the number of days before expiration you wish to receive the notification SMS. When you complete this procedure you can activate the Security Pin, by selecting payment method. What will change with ICANN’s new transfer policy? How do i renew my service at Papaki? What is DNS Hosting Services? I filled the online order form, but I want to know when the domain I ordered will be activated. How do I create A Records for my domain at Papaki? How do I change the billing information for a service at Papaki when Auto Renewal is activated?